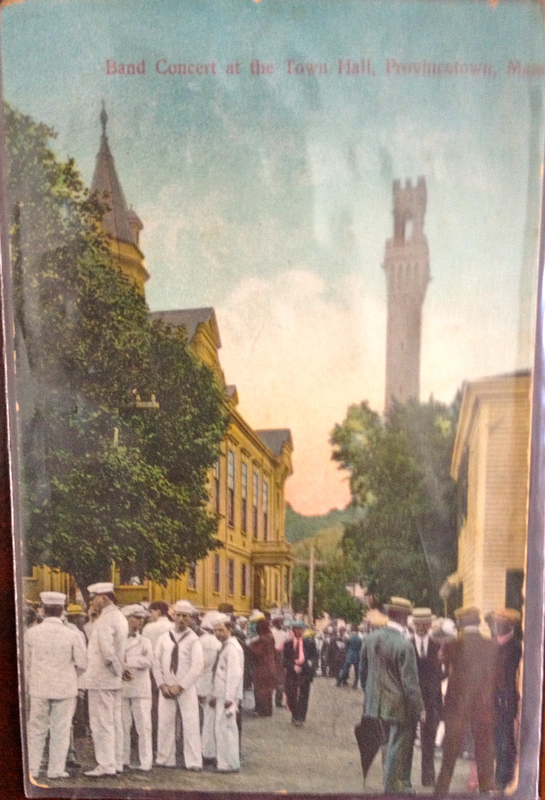 Antique Postcard , color lithographic print, mailed with a two cent stamp. 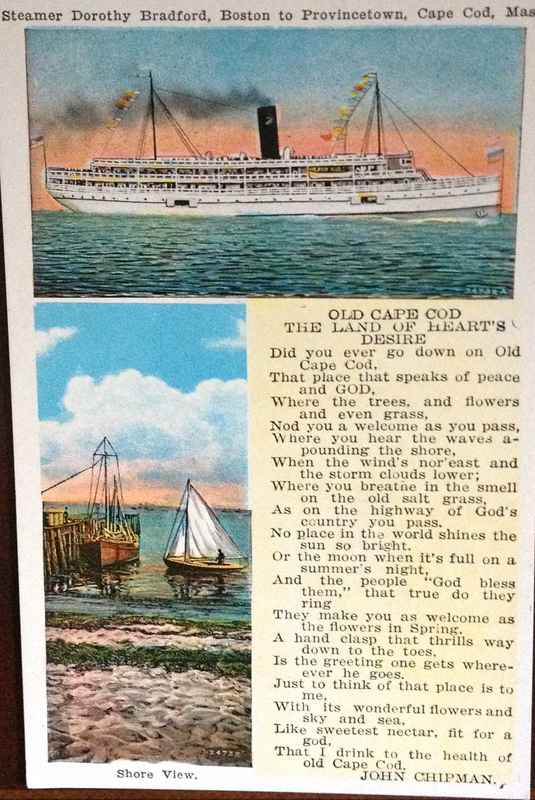 At the time this postcard was printed and mailed, there was still a train that traveled the length of Cape Cod, all the way to Provincetown. 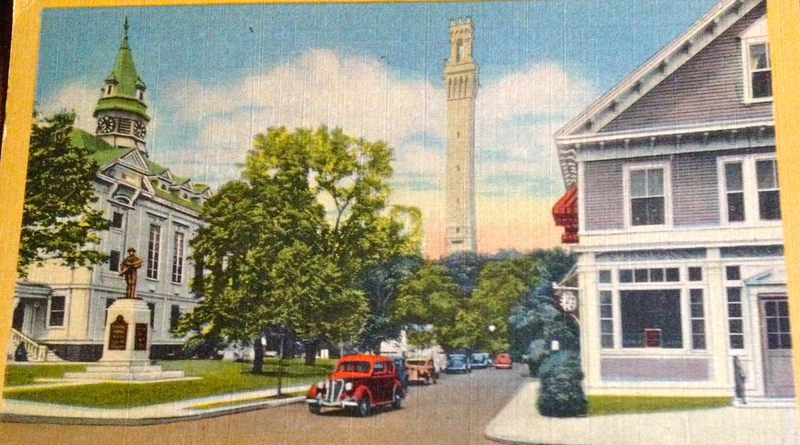 While Provincetown quickly became a bustling and densely populated settlement, Truro has remained primarily rural. 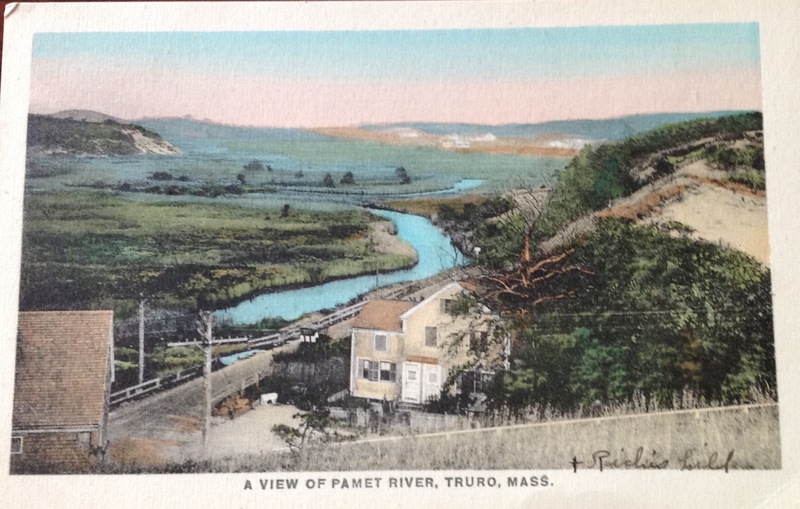 One of its fine features are the expansive sand dunes, marshes, and the Pamet River, shown in the above postcard. As the sequel to the mystery novel, “Remaining in Provincetown” opens, Len Milbury is going for a run from the Truro Town Center Post Office to Ballston Beach on the road that runs parallel to The Pamet River. In his backpack he carries a letter. Is it a clue? While the book’s title has not been finalized, there is another book that follows “Remaining in Provincetown”. In it you”ll get a chance to read more about the the lives and adventures of Frank Chambers and Roz Silva. But maybe you haven’t read the first book yet in which case, please do. A new batch of autographed copies are about to arrive at The Provincetown Bookstore at 246 Commercial Street. And if you aren’t going to be in Provincetown, then you can always order the book online as a trade paperback or ebook. Like us on Facebook where we have a fan page and keep the conversation going. Provincetown to Boston ferry come back soon! 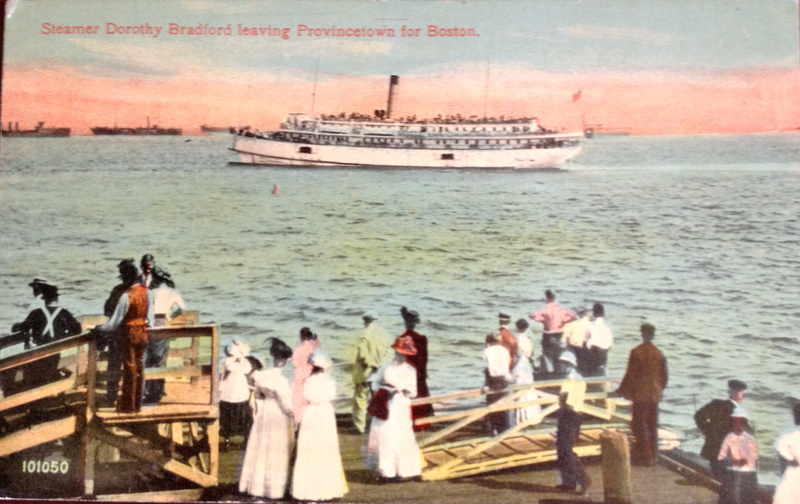 This antique postcard, circa 1900, was not as popular a card as the one tourists arriving from Boston to visit Provincetown. That’s when the excitement begins. These folks, although they are so nicely dressed with those handsome hats, long dresses, vests, and waist coats, look a little downcast. Their friends are on their way to Boston after a fun time in Provincetown. They’re leaving. Hope they get to come back soon. Times have changed, but a boat– the Fast Ferry– still travels the same route. And some of us still send postcards, although often we do so by email. The Fast Ferry is having a postcard contest, so check it out on their website. Meanwhile, if you haven’t visited the Remaining in Provincetown facebook page, we are also having a contest. We want you to like our page, if you haven’t already, and tell us your favorite month to visit Provincetown and why. 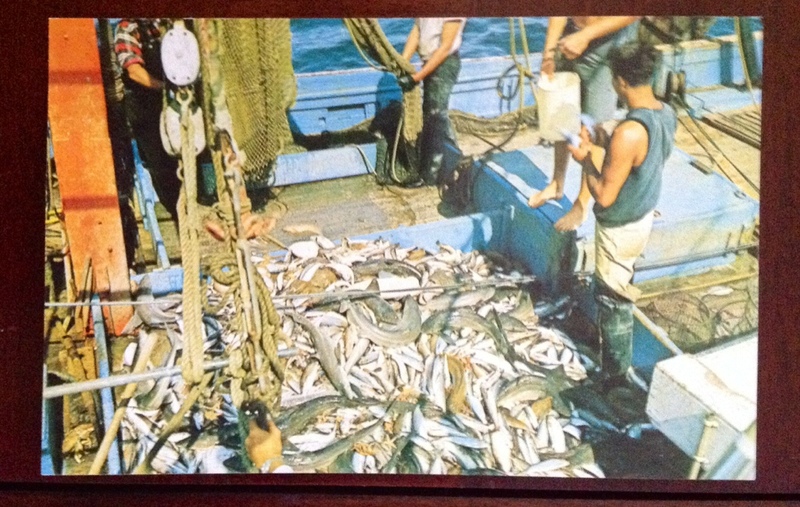 We’ll be sending the winner a signed copy of Remaining in Provincetown by S.N. Cook specially inscribed to the winner. So play the game and enjoy the town. The sandbars off the tip of Cape Cod , even with the Provincetown lighthouses at Race Point, Woods Hole, and Long Point to alert passing ships can be treacherous. 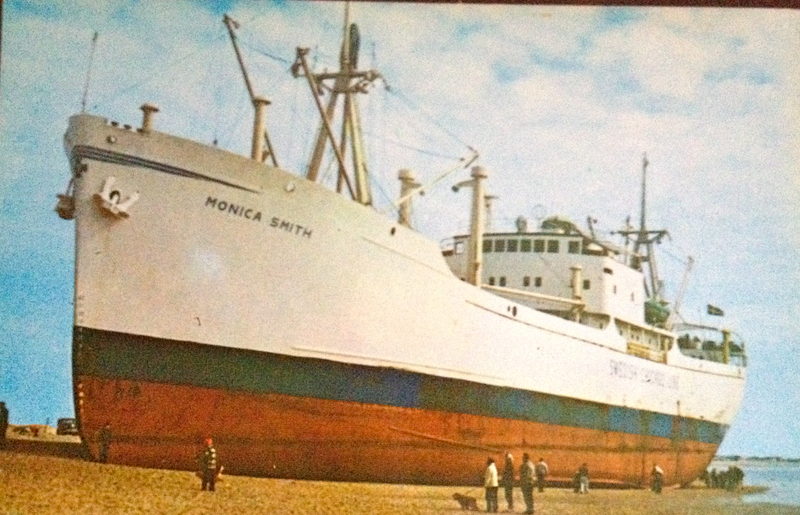 Fortunately in the case of the Swedish freighter, Monica Smith, enroute from New Bedford to Nova Scotia, no damage was done. This photograph was taken on February 23, 1960. A storm caused the vessel to be beached at Provincetown, Massachusetts, where the boat remained until tugboats could be assembled and then during high tide, with the help of her anchors, she safely floated out to sea and started up her engines. When you live by the sea, you learn to deal with unexpected weather and unexpected events like a murder. What happens in a small town like Provincetown, economically dependent on tourism, when a crime takes place? Who had a motive to kill one of the town’s leading citizens? The ending may surprise you. 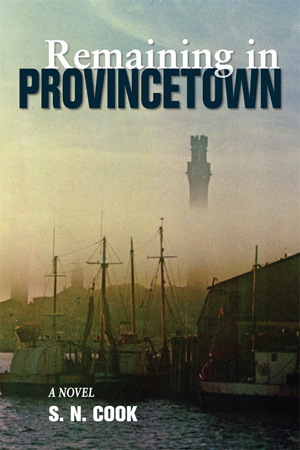 Get your copy of the new novel Remaining in Provincetown by S.N. Cook in time for summer beach reading. Now in bookstores and online, in trade paperback and as an ebook. Like us on Facebook and keep the conversation going. That sense of intimacy is one of the characteristics of a small town. It’s one reason why so many people gravitate towards places like Provincetown. Want to experience more of what it’s like to live in Provincetown, who maybe what it could have been like for some residents in the 1990’s. Buy a copy of the fabulous new novel, Remaining in Provincetown by S.N. Cook available at bookstores and online in trade paperback and ebook. 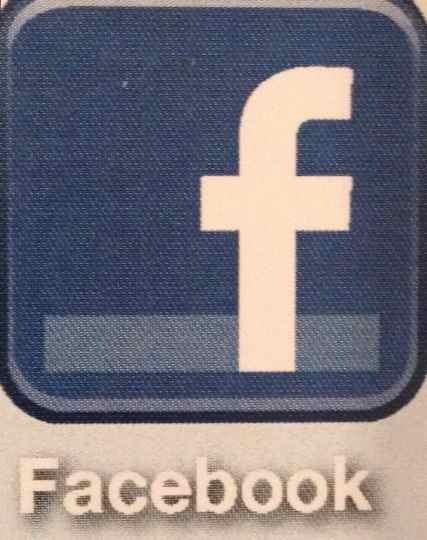 Like us at Facebook and keep the conversation going.